About me menace of dire things to come. 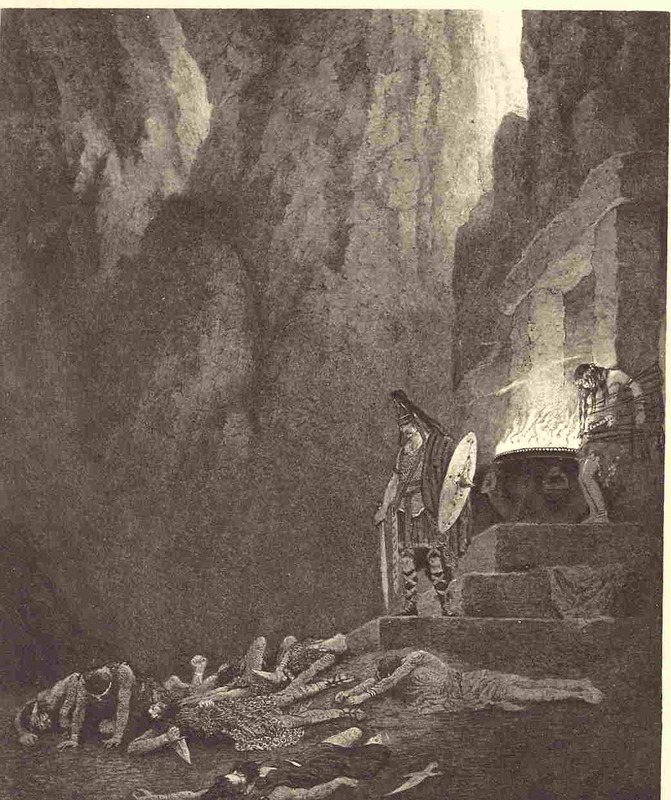 [Gwydion takes up the cauldron. The fortune and the torment of my race. Upon these isles for ever. Mark! And barren regions bind and mask. Acceptance of the darkness that you rule. The collaboration between the artist S. H. Sime, the poet/librettist T. E. Ellis (Lord Howard de Walden), and the composer Joseph Holbrooke, is fascinating, and I am continuing to delve further into their association. A nice article on the ghost story with views expressed by some contemporary exponents, from The Bookman, December 1923. We are such stuff as dreams are made of, and it seems likely that ghosts and fairies are even more so. Peter Pan may be right in suggesting that fairies only exist so long as we believe in them, or it may be that, like ghosts, they have an existence whether anybody believes in them or not. With our inherited instincts, traditions, knowledge, it should be possible for us to dream of things that have never actually come within the range of our personal experience; but could primitive man invent or dream of things he had never seen or been told about? It looks anyhow as if these unsubstantial creatures being come into our consciousness, the fairies can never be permanently banished from the world nor all ghosts laid for ever. One age grows sceptical and denies them utterly, but the next repents and they are taken back into belief again. Not many years ago they were so out of favour that the very Christmas Annuals, where ghosts had for so long been at home, would have no more of them; people were said to be weary of them and their incredible appearances. More recently editors and publishers, here and there, laid it down that nobody wanted fairy stories — the children of the new days were past them and wanted something more sensible. (1) My "attitude" towards ghost stories is one of enthralling interest and admiration if they are well told. I regard the ghost story as a perfectly legitimate form of art and at the same time as the most difficult. Ghosts have their own atmosphere and their own reality; they have also their setting in the everyday reality we know; the story-teller is handling two realities at the same time; he is working on two planes, in two atmospheres, and must fail if he lets one do violence to the other. (2) I am not a judge of "popularity," but I should say off-hand that an interest in ghost stories has always existed, and is neither a sign of morbidity nor of "increased belief in spiritual phenomena." The ghost-lover is on the look-out for his own special thrill, which is, or may be, independent of any belief in the supernatural. (3) I think Henry James's "The Turn of the Screw" the most perfect and the most convincing ghost story I’ve ever read. I thoroughly enjoy a good ghost story. No, I don't think their popularity is a sign that the public is becoming morbid. Nor do I think it indicates a renewed belief in spiritual phenomena. Since Lord Lytton wrote "The Haunters and the Haunted, or the House and the Brain," and no doubt long before then, the average man has, I think, always enjoyed reading a tale of the supernatural. I think the best ghost story I have ever read is contained in Henry James's volume, "The Two Magics." (1) My "attitude towards ghost stories" has always been one of amused incredulity, and surprise that any reasonable person with a sound brain should believe in them. "Ghosts," if seen at all, are always projected from one's own imagination. A moment's concentrated visualisation will enable me to see anyone I wish to see, whether such person be dead or living, and there is nothing terrifying in such "apparitions" which are always evoked by one's own mind. "O day and night, but this is wondrous strange!" "And therefore as a stranger give it welcome!" (3) "Hamlet," because in this instance the "Ghost" is not projected from Hamlet's own mind: it appears to others not closely concerned with the tragedy, before Hamlet himself sees it. This opens the way to some interesting speculation as to what Shakespeare thought of psychic phenomena in his day — a day which was rife with superstition and witchcraft. But like all discussions concerning t h e world's greatest poet, we are not likely to find any clue to the workings of that marvellous brain. (1) If a ghost story succeeds in making my flesh creep I like it and approve of it. It has to my mind no other raison d’être. (2) I think there is a renewed interest rather than belief in spirit phenomena, and undoubtedly that leads to an increase in ghost stories. (3) The most convincing ghost story I ever read is "The Turn of the Screw," by Henry James. If ghost stories are more popular of late, I should think the cause is to be found in the revival of interest in mystery and adventure which we see in many other forms. I don't believe that a liking for ghost stories is connected with a morbid turn of mind. So many lovers of such things have been, like Scott, most normal people. Nor do I see any connection between ghost stories and the modern dabbling in the occult. Some of the best ghost stories were written in the sixties and seventies, And the mid-Victorians were neither morbid nor credulous. When you ask for a "convincing" story you impose a rather awkward test. I don't know that I was ever convinced even for the moment of reading. But I fancy the most eerie thrills I have ever had came from Dr. Montague James's stories—for instance "The Diary of Mr. Poynter" and "Number 13." I take it of course that you want ghost stories in the precise sense, not such things as "Thrawn Janet" or Wandering Willie's tale in "Redgauntlet." I loathe and abominate ghost stories. All those that I have read appear to me to be utterly inane and silly. The reason of their present popularity is surely pretty obvious. It is the outcome of that post-war wave of spiritualism, which was a movement organised by a bunch of charlatans, who saw the sound commercial possibilities in the exploitation of the grief of those who had lost their sons and lovers in the war. I believe in spirituality, but I do not believe in spiritualism or ghosts. If I met a ghost I should cut it. The invention of ghost stories is a comparatively easy form of fiction; and as long as there seemed to be no foundation for the reality of such things, this kind of fiction was harmless and possibly amusing. But now that unexplained phenomena are known to occur, and a serious effort is being made to investigate than and to sift out truth from falsehood, the further invention of imaginary sensational occurrences is undesirable, and may be confusing to those who are not scrupulous about evidence. What the public is really interested in is the amount of underlying truth, and the meaning that may be involved, in supernormal experiences. To arrive at sound conclusions demands careful and continued and unbiased study; the concoction of imaginary narratives is useless to that end, and is not what the public really wants. Nevertheless, in illustration of the information we have so far obtained, it may be legitimate for people with literary gift and adequate knowledge to expound or exhibit their present conception of the less familiar side of the universe, under the guise of an imaginative sketch, or other form of dramatic representation. The public must learn that such efforts represent nothing more serious than the present views of the artist or scribe. If he is a genius his work may be of interest, and may be helpful, even though it must be regarded as scientifically negligible. The standard example of the kind of thing I mean is Bunyan's "Pilgrim's Progress." It has been edifying to thousands, and no one can be misled into supposing it a narrative of fact. The time is not yet anything like ripe for a complete formulation of the facts: but when that time arrives, it will be found, I expect, as usual, that Truth is stranger than Fiction, and that Imagination falls, not perhaps superficially but deeply and seriously, below Reality. (1) My attitude towards ghost stories? Presumably this refers to the use of ghost stories, invented ad hoc or alleged to be true, in fiction. My attitude towards such is the same as towards any other raw material of fiction—if the result produces the effect intended by the writer upon the mind of the reader, evokes, i.e. a powerful emotion, its use is automatically justified. Hamlet without the ghost would lose much of its dramatic strength. (2) I consider that their popularity is neither a sign of increasing morbidity in the public nor an indication of actual belief in the reality of spiritualistic phenomena. It is merely another aspect of the universal and primitive craving for the "Undiscovered Country" which, under various metamorphoses, from the Odyssey onwards, has been one of the main themes of Romance. The restriction of the geographical field, consequent on the explorations of the nineteenth century, has perhaps tended to emphasise—for writer and reader alike—the unexhausted potentialities of the psychical Unknown, dimly lit by a lamp of Science not yet carried beyond the threshold, and whose alleged phenomena awake atavistic echoes (which do not necessarily prove the phenomena untrue) in the minds of all of us. Since the atavistic echo is perhaps responsible for the magical though not the philosophical beauty of true poetry, it must necessarily be potent in any other form of imaginative literature. The instinct of a certain type of writer will be to employ it; the instinct of almost all readers will be to thrill to it. Also, since the latest hypotheses of Physical Science tend to break down the nineteenth century distinction between the material and the immaterial, and these things filter down into the collective consciousness of the public, both writers and readers feel themselves justified in exploring potentialities and alleged phenomena which a preceding generation, educated to a scientific Positivism, was compelled—in defence of any reputation for intelligence —to reject with scoffing incredulity. Since the ban has been somewhat lifted, both writers and readers hasten to avail themselves of their new freedom. (3) In fiction or alleged fact? The number is so vast that I beg to be excused from definite choice. In fiction, the first that comes into my head is Kipling's "They"—but, possibly, if I set myself to a recapitulation of all that I have ever read, I might remember something more convincing though certainly not more beautiful. (1) Stories dealing with the supernatural always interest me—provided that they are written by believers in the future life. (2) I think their popularity is owing to a renewal of belief in spiritual phenomena. (3) The two most convincing ghost stories I have ever read are the apparitions of Strafford in "John Inglesant," and the passage about the cat in Monsignor Benson's "Necromancers." It is odd how some people, in their distaste for the abnormal and the supernatural, will try to make out that the ghost-story is something new. Fairies, I suppose, need no defence, except from the attacks of humourless educationalists. Dreams are either out of favour or violently in fashion, according to your view of Freud and Jung. But ghosts, spirits, obsessions of places or persons—stories about these will rouse an unintelligent. anger which springs, I believe, from a frightened materialism. It is more comfortable if you believe a tree to be just a tree, a river nothing but water for washing or power, and a mountain a rather larger lump of dirt. But science does not hold that view now, religion has never held it, and common sense—well, common sense is the craft of treating and using things, not the art of understanding them. There is, however, a new "magic" story. You can find its beginnings in Poe; it is implicit in much of Hawthorne; Le Fanu was groping after it, and Lytton wrote the first example of it. Its power lies in this: that the author assumes that life, experience, sensation, memory and fancy contain something which neither reason nor common sense can satisfactorily explain. Generally the author of the new kind of magic story treats life, or some aspect of life, as sacramental: the pioneer in our day was Mr. Arthur Machen, and he was succeeded by Dr. James, Monsignor Hugh Benson, Mr. E. F. Benson (whose "Image in the Sand" is not nearly well enough known), Miss Violet Hunt, Mr. Algernon Blackwood, and, in one inimitable volume, "The Celestial Omnibus," Mr. E. M. Forster. I do not see how an attitude towards life which appeals to these men, and has since appealed to Mr. J. D. Beresford, Miss May Sinclair and Mr. Walter de la Mare, can possibly be dismissed as nonsense. The attitude in all of there is roughly the same, but the approach varies widely. I have no doubt that the greatest of these are Mr. Machen, Mr. E. M. Forster and Mr. de la Mare. I am a great admirer of Miss Sinclair's last book, but I find her method rather too philosophical compared with Mr. Machen's frank appeal to magic, Mr. Forster's reliance on a kind of impudent fancy, and Mr. de is Mare's accepting mysticism. Whether the art of these stories is legitimate or not seems to me a barren question: it is generally asked by those who wish a story to have some immediate purpose, and not to travel outside their experience of life. This demand would have hampered the world's greatest: the ghosts in "Macbeth" and "Hamlet" are not there deliberately to instruct or improve us. But if you must defend it on ethically utilitarian grounds, I cannot imagine creative literature having a better job than reminding an age too immersed in sensuous experience that a knock on the door may not be the postman's, and the wind in the chimney or a tapping on the wall may be other than they seem. Science has got rid of matter: why should art cling to materialism? It is just worth noticing that some of the most successful "ghost stories" of our time have been written by novelists— Mr. Henry James, Mr. Rudyard Kipling and Mr. H. G. Wells—the bulk of whose work is concerned with the everyday life of everyday people. Also: Reggie Oliver reviews a new biography of Jerome K. Jerome, and collections by Richard Gavin and Thana Niveau; Doug Anderson explores the highly personal Rockall fantasy world of Antony Swithin, and three rare fantasies by other hands; and John Howard reviews a study of John Brunner, The Epiphanist by William Rosencrans, and other new titles. Corbel Stone Press have announced a new annual journal, Reliquiae, which "collects together both old and new work from a diverse range of writers and artists with common interests spanning landscape, ecology, folklore, esoteric philosophy and animism". The Press are already responsible for some fine music and publications, imbued with the same sensitivity to nature and response to haunting landscapes found in the work of Machen, Blackwood and others. Each work is beautifully produced, with a care for detail and for elegant and fastidious design. - Two strange tales from Mark Valentine, including a new work, "For She Will Have Her Harvest", about the graveyard poet Henry Kirke White. - Noor de Winter on birch trees, music and the "artist-as-listener" in the work of of German expressionist writer and instrument-builder, Hans Henny Jahnn. - Two poem sequences by Richard Harms - "Salt", an 18th-century sea-voyage in five parts; and "Wing", a naturalist's minutely observed depictions of Australian bird-life. - Autumn Richardson's translations of a quartet of Inuit songs collected by Danish explorer Knud Rasmussen. - John Hutchinson on the "imaginal world" of Sufi mysticism. - Richard Skelton's elegy for the now-extinct grey fell fox. - Mark Brennan's oil paintings of the Canadian wilderness. Richard Brereton Marriott Watson was reported missing in action in March 1918, and later presumed dead. The son of a novelist and a poet, he had taught himself Japanese so that he could translate some of the exquisite and fugitive verses in that country’s literature. They were published in a journal just one week before he was lost: he probably did not live to see them in print. 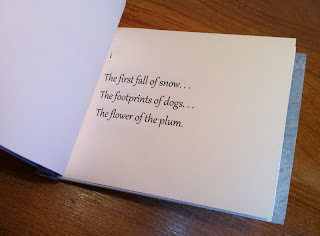 Now his versions of the Japanese poems have been rediscovered and brought back into print for the first time. Jo Valentine has created a limited, numbered edition of 25 handmade books which respond to the young translator’s work in a sympathetic and striking design, using Japanese hand-made paper and Japanese stab-binding. Mark Valentine provides a short introductory note about R.B. Marriott Watson. The book is the first publication of their new imprint, Valentine & Valentine. Other titles are in preparation. UPDATE, 3 April 2013: all copies have now been taken. Thank you for your interest. A new title will be announced soon.